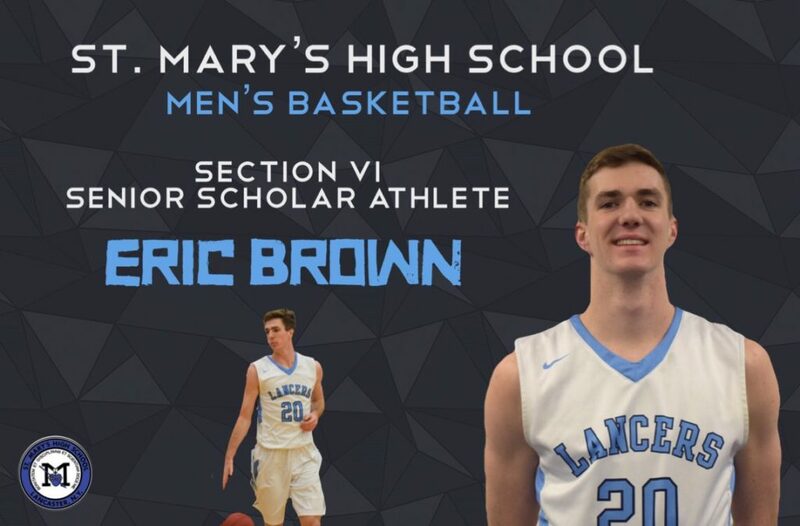 Congratulations to senior, Eric Brown on being named a Section VI Scholar Athlete for the winter sports season in Western New York! A Dean's List and National Honor Society student, Lancers get it done inside and out of the classroom! Postseason accolades are starting to roll in for St. Mary's winter sports teams. 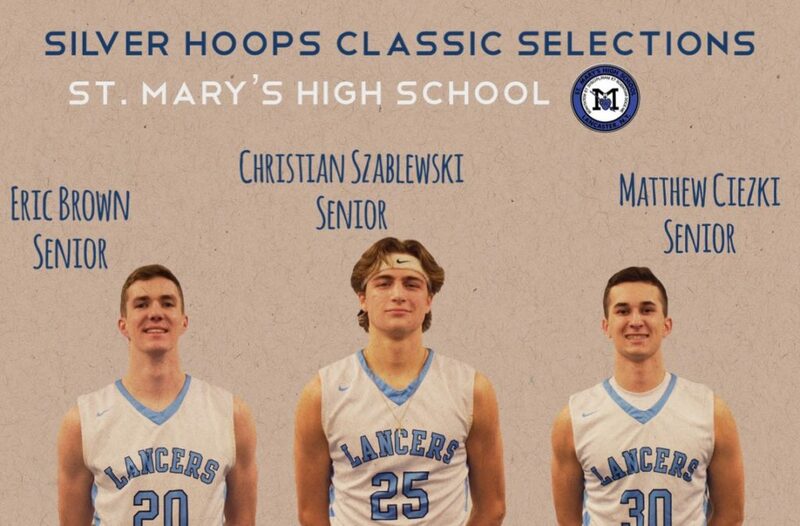 The Men's Basketball Team will send three seniors to the Silver Hoops Classic - Eric Brown, Christian Szablewski, and Matthew Ciezki - where they will represent the Monsignor Martin against Buffalo's Public All Stars. The men's basketball team's season came to an end with a tough loss to Niagara Catholic in the MMHSAA semifinals. Great season, boys, and thank you to the 10 seniors who left their heart and soul on the court for Lancer basketball! The men's basketball team honored its graduating seniors against Christian Central Academy, sending them off with a win! Basketball players pictured (left to right): Ahmad Powell, Matthew Ciezki, Kofi Osei, Jacob Lukasik, Ja'shawn Collins, Ben Mazurowski, Christian Szablewski, Jae'lin Russell, Eric Brown, and Frank Propis. The men's basketball team will honor an astounding 10 seniors on Feb. 8th when they take on Christian Central Academy at home. 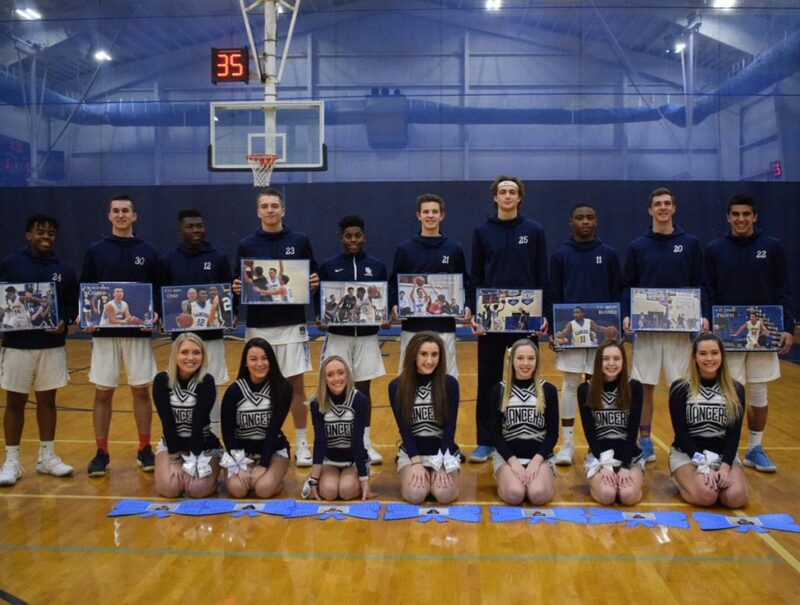 These seniors are: Eric Brown, Matthew Ciezki, Ja'shawn Collins, Jacob Lukasik, Ben Mazurowski, Kofi Osei, Ahmad Powell, Frank Propis, Jae'lin Russell, and Christian Szablewski. Come on out and support the boys! Varsity game tips at 8:00 p.m.
St. Mary's opened Monsignor Martin league play with a 67-64 victory over rival, Niagara Catholic. Eric Brown, Christian Szablewski, and Brady O'Brien led the way for the Lancers, who remain undefeated. 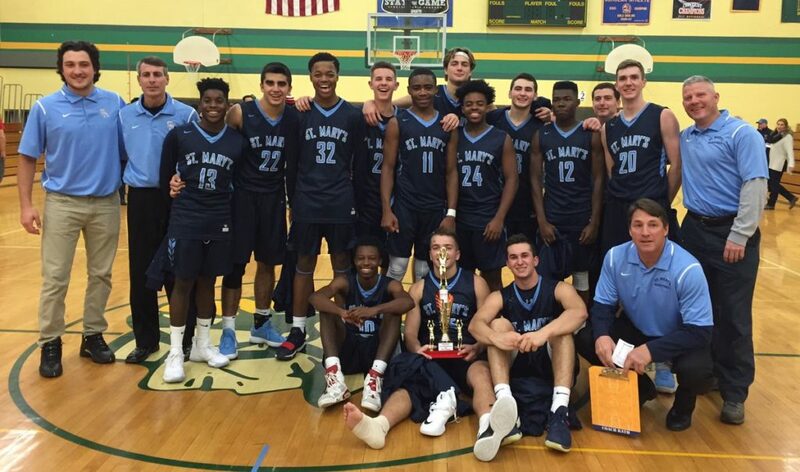 St. Mary's boys basketball had quite the Christmas break, taking the championship in not one, but two holiday tournaments. First up, the Lancers took home the Depew Holiday Tournament, beating the hosting Wildcats 66-37 in the final. Later in the week, the Lancers took to the court in the Five Guys Holiday Classic. They knocked off Olmstead, 57-49, and then advanced to play Williamsville North in the final. The final featured a thrilling Lancer comeback in the fourth quarter, propelling the Lancers to a 53-51 victory! Senior leadership was the key to the day for St. Mary's, as Matt Ciezki (20 points), Eric Brown (8 points), and Christian Szablewski (17 points) all made key plays to lead the Lancers to victory. Senior Matt Ciezki was awarded the tournament MVP and senior Eric Brown was named to the All-Tournament Team. In their first game of the season, St. Mary's battled cross-town rival, Lancaster in the ADPRO Sports Public vs. Private Challenge. On their home court, the Lancers put together a convincing victory, beating the Legends 73-58.